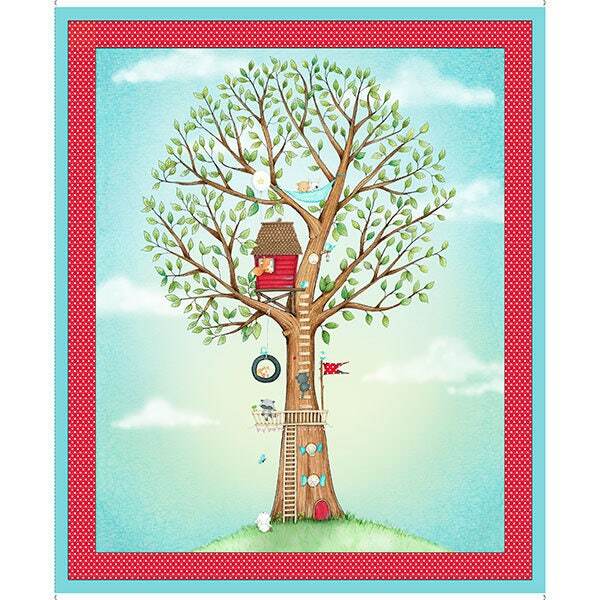 Designed by Stacey Yacula and licensed to Quilting Treasures, this cotton print fabric panel features a massive tree and adorable creatures hidden in the branches. It measures approximately 44" x 35" and is perfect for quilting, apparel and home decor accents. . Colors include white, black, grey, charcoal, light grey, red, dark pink, green, lime green, pale pink and shades of blue and brown. A sweet gift for a new baby and new mom. All fabric from The Quilted Nursery Children's Fabric Store is cut directly from the bolt in continuous yardage unless otherwise specified. We now offer fractional yardage for your shopping convenience. All shipping overages are refunded upon shipment of fabric. Same day shipping always except for Sundays and holidays.